Using the World's Most Popular E-mail Spider! Want to collect e-mail addresses for your projects, yet simply don’t have the time? Need to locate hundreds of new customers & affiliates? Want to find joint venture partners on a mass scale? Trying to locate link partners, but getting NOWHERE? Then you absolutely need to check out My E-mail Spider! My E-mail Spider is the world’s most popular (and intelligent!) e-mail harvesting tool. It enables you to retrieve thousands of targeted e-mail addresses from the Internet – in just minutes. No more hours of searching! It’s simple to get started. Just provide My E-mail Spider with a couple of keywords. The program will then begin searching Google and Yahoo! for those keywords, and visit each Web site in the results. As soon as it finds an e-mail address, it’ll add it to your list. It can EVEN outwit e-mail protection scripts and “broken up” e-mail addresses! My E-mail Spider is your ultimate business partner. It now takes just seconds to uncover a new wealth of customers, attract another thousand affiliates, or rocket your search engine ranking with link exchange campaigns. It’s the ONLY tool of its calibre – and, best of all, My E-mail Spider costs LESS than the price of a decent lunch! Continue to read the features, or click here to view screenshots. e-mail addresses. No hard work, no more manual searching. FULL SUPPORT for Google and Yahoo! Automatically search through hundreds of Google and Yahoo! search results. It’s easy, with My E-mail Spider! My E-mail Spider can even combat e-mail protection scripts and “broken up” addresses. It retrieves everything for you, perfectly! so they don’t slow down your e-mail address extraction. three different formats, so you always enjoy full control. so you can easily e-mail merge using Microsoft Word! My E-mail Spider supports many new and exclusive features, including stop and resume, automatic duplicate removal, multi-keyword searches, background scanning, and MUCH more! Can you believe it costs LESS than the price of a decent lunch to purchase My E-mail Spider? We’re talking about a program here that can boost your business, rocket your search engine rankings, and put you in instant contact with THOUSANDS of exciting individuals around the globe. It's the ULTIMATE Web marketing tool. And it'll cost you a TINY $19.95. Not a penny more! PLUS: Order BEFORE midnight Wednesday, January 30th 2019, and we'll give you a FREE copy of Serif WebPlus SE, one of the most powerful Web design tools on the market today - PLUS a MASS of FREE Web templates as an added BONUS. Interested? Who wouldn’t be! Then make your purchase NOW, by clicking on the below button. Prefer to pay by PayPal? Please click here. Approximately £12.95 or 14.95 Euros. Price converted to your local currency. Download links sent instantly. Windows & Internet Explorer required. Still unsure? Click here to see screenshots of My E-mail Spider in action! NOTE: It is your responsibility to use this program legally within your country. 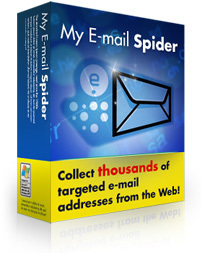 BUY My E-mail Spider WITH Extract Fax Numbers - SAVE $10! that allows you to instantly send out THOUSANDS of marketing faxes – at absolutely NO COST! That’s right, it’s 100% FREE to send out THOUSANDS of faxes across the globe. To learn more, visit www.extractfaxnumbers.com. Usual selling price $19.95. Approximately £18.95 or 21.95 Euros. Price converted to your local currency. Home | Screenshots | FAQ | Affiliates | Contact Us | BUY NOW!